The North Carolina HIV/STD Epidemiologic Profile is the most comprehensive and in-depth report available for HIV infection (including AIDS) and sexually transmitted infections (STIs) in North Carolina. It includes not only surveillance information, but also related information available from other agencies, as well as detailed discussions of HIV infection trends, risk factors, and differences among various demographic groups in the state. Special Note: For 2014 data, we are not producing a book-format State Epidemiologic Profile. 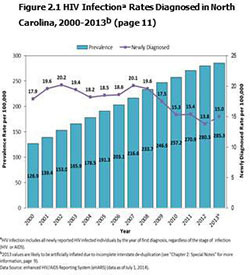 Profile data tables (located in Appendix D in 2013 North Carolina HIV/STD Epidemiologic Profile) have been included in the 2014 North Carolina HIV/STD Surveillance Report (see Annual Reports). We will also be producing a standard slide set and fact sheets; these will be made available on our website over time, starting in early fall 2015. 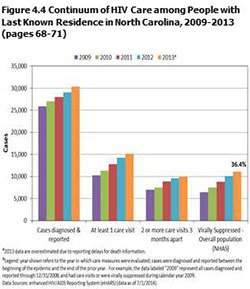 *See Archives for earlier versions of the North Carolina HIV/STD Epidemiologic Profile.